Professionals and legal advisors that support boards must navigate an increasing array of complex and evolving risk and compliance issues. From Dodd-Frank driven regulations to managing board effectiveness, it is critical to understand what is top of mind for your board. 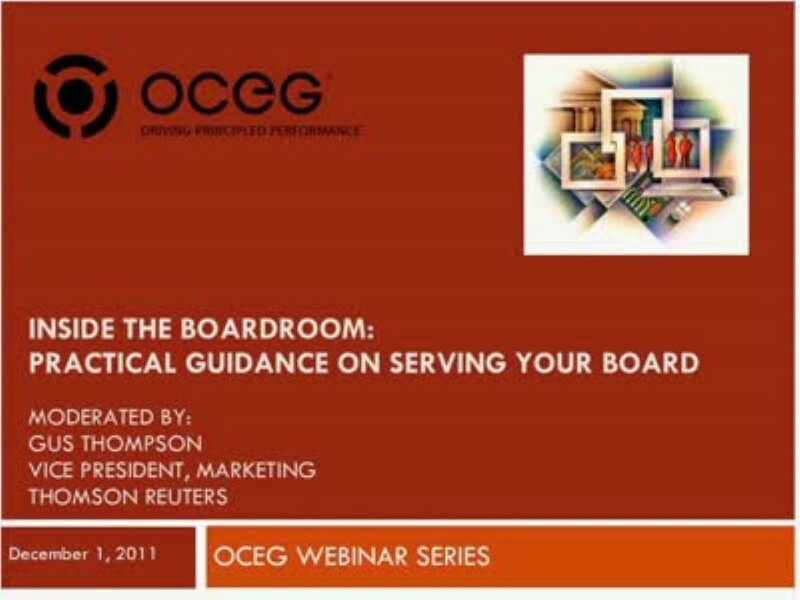 An appreciation of board member concerns will help you provide more intelligent information and enable the board to better deal with uncertainty and balance risks with potential rewards. We have emailed instructions to access INSIDE THE BOARDROOM: Practical Guidance on Serving Your Board to . Make sure the email arrives in your inbox: either add "support@oceg.org" as a safe sender to your email platform, or if you use Gmail, drag our email into your Primary tab.